Scale has different meanings according to disciplines, trades, and livelihoods. Thanks to words such as capitalism and globalization, scale is increasingly prevalent in everyday discourse. ‘Scaling up’, ‘scaling down’, and ‘scales of influence,’ are all phrases that help us better imagine and produce dichotomies such as global and local. Scale is a crucial word in the field of cartography. I’d argue it was perhaps the most important contribution to 15th and 16th century navigation, making this first wave of globalization possible. Scale can be a map’s greatest asset, and its greatest curse. The ability to see an entire city, an entire country, even the world has great psychological consequences on the human mind. Seeing it all feels manageable, even conquerable. Having a scale of 1:1 is of course impossible for that is reality; and so, as we increase scale, we are in many ways decreasing reality. Lately I’ve been very disappointed with the maps I’ve used. I find them ill preludes to my experience. Let me put this in context. Because I’ve been traveling this past month I’ve had many opportunities to use maps. Those given to me by hotels and tourist centers highlight attractions, list restaurants, and have a colorful border of various advertisements. Such maps focus on the imagined city center, or the assumed destination of tourists. Visual techniques such as a bright colors, large circles, and street names in large fonts help navigate the visitor to the center, reiterating it as a bustling yet legible place to the outsider. The first tourist map I received last month was of Gotenburg, Sweden. To cover the area under observation (the far reachings of the city’s public transit), the map had eight folds and seemed dauntingly huge. Because of bad rains I chose to use the highly efficient tram, which went north, then east through a tunnel carved out from a small elevation and eventually more north to where the conference was being held. One evening the sun came out for the first time. I decided I’d walk from the conference back to the hotel, thinking it would take at least an hour. I passed through part of the Gotenburg University full of small gardens. 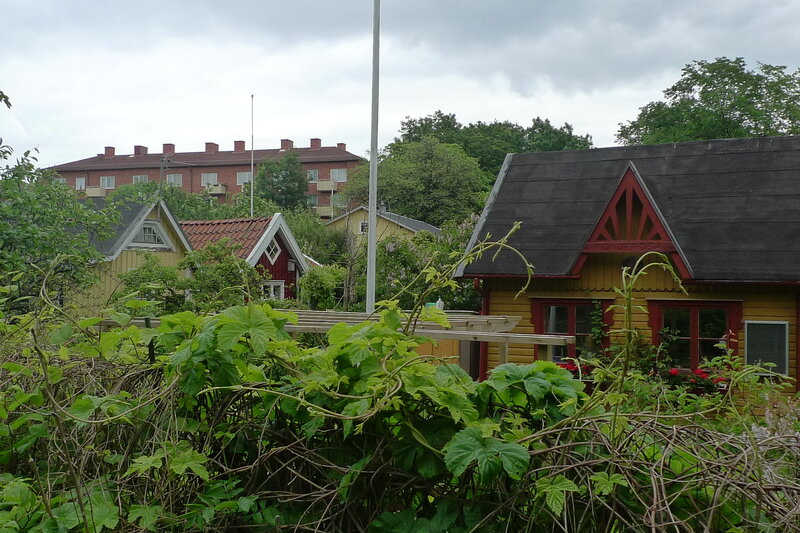 No one lives here, but each has a little shed-like structure, and small patio with a picnic table. As I was walked by, I could see many families preparing their evening meal. I then descended a bit, passed through another residential area and eventually arrived at the main commercial area. The entire walk took a little less than 20 minutes, or roughly twice the amount of time it did by tram. I didn’t use the tram after that, the University seemed as though it was right around the block. Now, I should mention that I’m actually pretty terrible at reading maps. As in, I generally don’t. I’m more of a glance-er; I wander until my doubt trumps my intuition. It is at this point that I look for some street sign and then quickly glance at the map to try and find that same road. Once I do, I look to see if it runs in the direction I want to go. If it does, I almost immediately put the map away. This strategy is highly problematic. Because I almost never check cross streets it usually happens that I’m on the right road but on the other side of town. In other words, I am scale-diffecient. 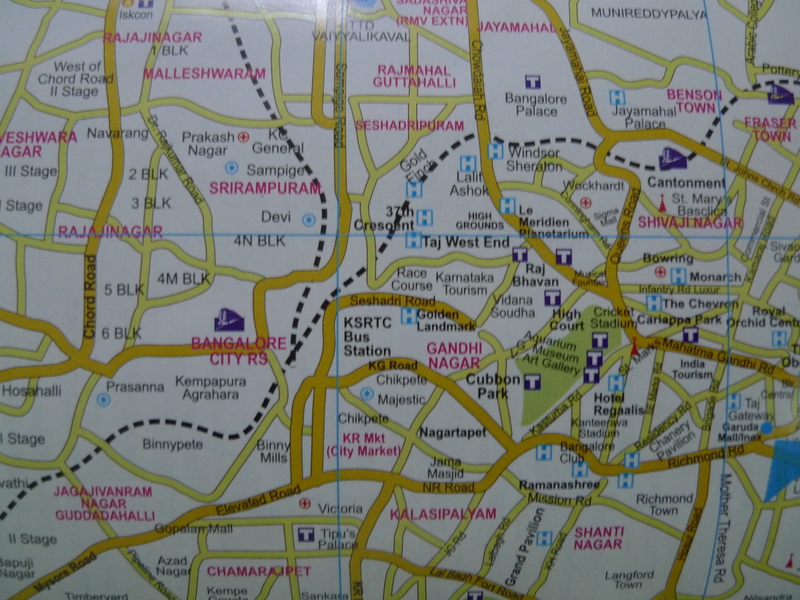 When I arrived to Bangalore airport the first thing I did was ask for a map from the information center. From the hotel I took a cab to one of the hotels that made up the border of the map—the one advertising non a/c rooms for 600 rupees and South Indian breakfast (hello sambar!). I arrived around three am, turned on the fan, and passed out. The next morning, I decided I’d walk to the central train station to get train tickets for my next destination. A few problems erupted. The only address on the hotel advertisement said “near Minerva Circle.” I could locate Bangalore City Railway Station but I had no idea where to look for Minerva Circle. I went to the man at the front desk and asked where Minerva Circle was. He couldn’t find it. He passed the map to the next person. He said south, it was somewhere south of the gardens. Together we found something circular—a roundabout in fact. Yes, that was probably Minerva Circle. I looked at the icon for the Bangalore City Railway Station. The distance was about the length of my index fingernail. Because I’m used to people assuming I’d rather take a rickshaw than walking, I decided to dismiss his opinion as ridiculous. I started off at 1pm with a positive attitude. I’d relearn the different horn pitches of urban India, the friendly honk from the menacing honk from the caution honk, and retrain my eyes to look both down and forward for anything and everything that may come in front of me. But by 2pm I was beginning to feel like not much progress had been made. I was afraid to pull out the map because as soon as I looked like I was walking without certainty, I was sure the rickshaw drivers would spot me as a vulture spots something dead, they’d descend upon me with their exuberant rates, and I was certain this should be a less than 50 rupee ride. By 3pm I was beginning to get frustrated. I pulled out the map to look at the scale…only there was none! Just in big letters MAP NOT DRAWN TO SCALE. Well I’ll be damned. I didn’t know mapmakers were as careless as me. And so I did. Till it was 5pm. Okay. So maybe it really was seven kilometers from the chai stall. 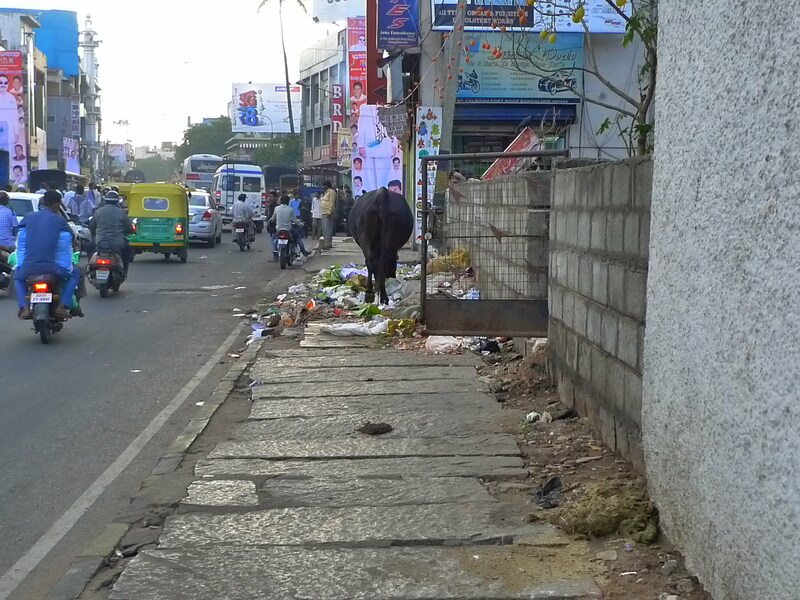 Or maybe it felt like seven kilometers because Indian sidewalks are in perpetual crises, uncertain if they are actually part of the road, a cleverly disguised storm water system, or an extension of an individual shop. As a result, walking one kilometer often feels like two or three. Let me not keep you in suspense. I finally reached the station at 5:30pm. My arrival felt like a much greater achievement than I’d originally anticipated. After buying the train ticket in question I walked over to the bus terminal, determined to get back to ‘near Minerva Circle’ by public transit. There were no maps, no scales, but it was definitely still an adventure.